To mark the sixth anniversary of Shakespeareances.com this month, I decided to do a more thorough study of the Bard on the Boards archives to definitively rank the frequency each play was produced in the past half-decade. This is a slap at my ego to write this, but Bard on the Boards, my list of William Shakespeare productions current and coming, is the most popular feature on Shakespeareances.com. Snout (Paul Riopelle) plays Wall and Bottom (Mathew Lewis Johnson) plays Pyramus in the Cincinnati Shakespeare Company's production of A Midsummer Night's Dream, the popular William Shakespeare play the theater chose for debuting its new Otto M. Budig Theater. Photo by Mikki Schaffner, Cincinnati Shakespeare Company. I would love to think that my reviews and commentaries get more readership than a list of plays at theaters around the world, but my weekly website reports are consistent in that the most visited pages are the two Bard on the Boards' lists: What's Playing Where (Shakespeare and Shakespeare-related plays in production) and Where's Playing What (the scheduled playbills for theaters represented on the Theater Links page). True, those plays are far more popular than anything I write. How popular? Or, to the point of this particular essay, which of Shakespeare's plays are his most popular? A potential answer is right here on Shakespeareances.com in the lists that comprise Bard on the Boards. By studying the What's Playing Where archives, I've compiled a ranking of all of Shakespeare's plays according to the frequency that they have been produced over the past half-decade and in the past year. The idea is not mine. In September 2016, Priceonomics used my What's Playing Where to determine Shakespeare's Most Popular Play. As they were on a quick deadline, I provided them a dozen or so lists from my Mac’s Time Machine (auto backup) archive, choosing dates I knew would offer the most comprehensive sampling year to year. That met their deadline, but to mark the sixth anniversary of Shakespeareances.com this month, I decided to do a more thorough study of the Bard on the Boards archives to definitively rank the frequency each play was produced in the past half-decade. I also decided to use this information—with last year’s Priceonomics publication as the jumping-off point—to measure year-to-year staging trends for each play going forward. Frankly, a lot of work goes into maintaining Bard on the Boards, the mundane task eating up more time than I personally appreciate even as I acknowledge the lists’ public service and popularity. Now, I’m injecting a little fun into the effort, and we all might glean a bit of Shakespeare scholarship out of the effort, too. And on that note, I'll start by pointing out that "definitive ranking" is a relative term. Bard on the Boards does not list every Shakespeare production, just those of Shakespeareances.com–linked theaters, and I only link a company once I have its permission to do so. When I first launched Shakespeareances.com, I had about 70 theaters linked, a number that has since grown to 213. While I strive to update Bard on the Boards weekly, several weeks are missing in the archives, periods when the Mac Time Machine was not working properly. So, the numbers are not even the total of what I’ve listed over six years. Furthermore, some anomalies exist within what I’ve been able to capture. For example, productions remounted or touring to more than one linked theater would be counted as separate productions, and though I do my best to monitor every linked website, some productions slip past me. Nevertheless, Bard on the Boards is the most exhaustive list of its kind that I (and Priceonomics) know of, and even with the gaps and minor anomalies, it serves as a legitimate sampling of all Shakespeare productions, a sample that totals 1,595 productions of Shakespeare plays. This list includes productions of Shakespeare's poems as well as titles in the Shakespeare apocrypha, plays with evidence of his hand in their composition. However, it does not include off-shoots, such as Rosencrantz and Guildenstern Are Dead or the products by the Reduced Shakespeare Company, such as The Complete Works of William Shakespeare (abridged). The most produced play has been A Midsummer Night's Dream with 118 stagings, outpacing by 29 productions its nearest rival, Romeo and Juliet, a tragedy that has the advantage of being traditionally staged around Valentine’s Day. The “greatest literary work of Western civilization,” Hamlet, comes in third at 86 with Twelfth Night’s 85 right on its heels. Much Ado About Nothing rounds out the top five with 79 productions. Here is the total list. It makes sense that A Midsummer Night’s Dream is Shakespeare’s most popular play, at least in this decade. Most of its humor is physical, and its lyrical comedy is timely (i.e., “How low am I, thou painted maypole?” always gets an “ooooh” from audiences). Actors may disagree with my next assessment, but it seems to me that A Midsummer Night's Dream is an easy play to stage, with easily defined characters—simple handymen, young lovers, and fairies—and an audience-friendly plot with a lot of leeway for staging its comic set pieces (many directors I’m certain will disagree with this assessment, given the number of productions I’ve seen trying to turn the play into serious drama). 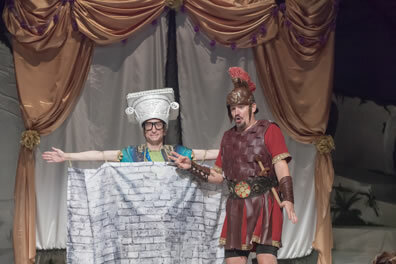 It’s the kind of play that companies of all different sizes, production capabilities, and talent levels can mount and leave audiences laughing to tears. The most interesting entry for me is King John tied at number 29 with Henry IV, Part 1, the former one of Shakespeare's more obscure works, the latter one of his most famous plays, featuring as it does the characters of Falstaff and Prince Hal. I'm glad to see King John get some love, but acknowledging that Henry IV, Part 1, is my second favorite Shakespeare play behind King Lear (number 12), I think this tie at 28 is evidence that Henry IV is criminally under-produced. Does Dream speak to our times in any particular way? Let’s break out the What’s Playing Where listings for the past 12 months. A Midsummer Night’s Dream with 27 productions drops to a tie at number five with The Tempest, and Romeo and Juliet shifts into the top spot with 33 and Macbeth right behind with 32 (The Tempest and Macbeth are numbers six and seven, respectively, on the six-year-total list, so that’s a five-slot jump for the Scottish Play). Twelfth Night (29), Hamlet (28), and Much Ado About Nothing (28) complete the top five of the past year's most popular plays. Tybalt (Alex Mickiewicz, left) fights with Romeo (Andrew Veenstra) in the Shakespeare Theatre Company's production of Romeo and Juliet. The tragedy of young love amid a society riven by violence is William Shakespeare's most-produced play the past year. Photo by Scott Suchman, Shakespeare Theatre Company. Romeo and Juliet, aside from its perpetual popularity and February favoritism, has become a particularly pertinent play for our times with its themes of a riven society driven to senseless violence by “ancient grudge.” I’ve seen a handful of recent productions highlighting this aspect of the play. Does Macbeth, which gets a traditional October bump, speak to our times, as well? I've seen one production of Macbeth that did, and one that didn't. Meanwhile, I note that Julius Caesar, which has been directly tied to the political environment of the past two election cycles in the United States, moved up only one slot, from 10 in the totals rankings to nine for the past year. However, Richard III, a play more obviously connected to despotism and fascism, jumped from number 14 in the totals list to 10 for the past year. So, if not politics, then the menacing nature of dicatorship and brutality in Richard III and Macbeth might be striking a current chord for today's audiences (or, at least, the theaters staging the plays). On the other hand, Love’s Labour’s Lost also jumped five spots in last year’s rankings, and I’m not sure what that tells us. Just as interesting is the case of Henry VIII. It was produced seven times over the past six years, but not at all in the past year. A similar trend occurred with Troilus and Cressida: 14 productions over six years down to just two productions this past year, dropping from a rank of 31 (tied with Timon of Athens) down to 37 (tied with Two Noble Kinsmen and conflations of Henry IV, Parts 1 and 2). These titles reflect an anecdotal trend I’ve noticed in the industry. When Shakespeareances.com first started six years ago, several theaters were attaining their goals of having staged the entire canon of Shakespeare’s works, so the lesser known plays were appearing with greater frequency than the historical norm. Canons completed, those plays are retreating back to obscurity and Henry VIII back to the shelf. Going forward, I will maintain the totals list on an ongoing basis, updating the rankings with each new listing on Bard on the Boards. Then, next August (when the summer season is in full swing and fall and annual seasons are generally set), I’ll revisit the annual trends. To visit the new index (with newly announced productions since August 1), click here. Which also is a statement of commitment: six years into this venture called Shakespeareances.com, we will keep Shakespeareancing.